If you've been following my blog, you know that Pine Bros asked me to try out their relaunched throat drops recently and that I loved them! Well, I Pine Bros was so awesome in sending me several sample packs that I'd like to share the love. 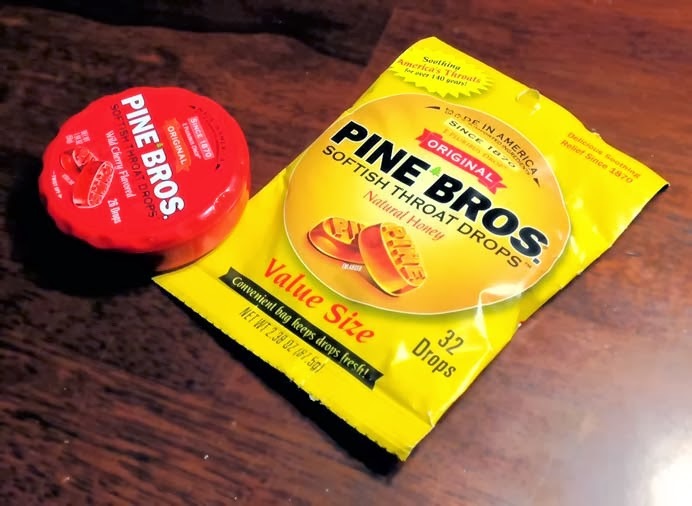 Read my review of Pine Bros Softish Throat Drops and if you decide you want to try them too, leave a comment telling me me which throat drops you use now when you're sick and I'll pick two people who comment to get a free value size bag of drops! I have one honey pack and one cherry pack available. My only request is that you please be over 18 and living in the United States. This won't be a random winner like my other giveaways. I'll pick two winners based on what seems like a real interest in trying the product and a thoughtful comment. Winners will be selected on Friday, the 14th at noon CT.
My friend, Andrea, who sometimes helps with my reviews said she tried the cherry and loves them (I'll post her detailed feedback when I announce the winners on Friday). Even my husband, who doesn't usually like throat drops, said they're not bad (that's good coming from him). Ok, so share your thoughts on throat drops. Tell me what you use now. Share if you like honey or cherry or both. Tell me if you've tried Pine Bros in the past. Just get to commenting and I'll pick winners on Friday!